The Prickly Pad™ is an acupressure pad based on ancient science. This acupressure (Reflexo-therapy) applicator is combining Indian and traditional Chinese medicine. Both Eastern medical systems have been proven as healing methods to eliminate many ailments. The therapeutic benefits resulting from use of the Prickly Pad™ acupressure applicator are based on several working mechanisms that complement each other and increase each effect. The pressure tips of the acupressure applicator stimulate the skin such that the skin temperature increases. Direct consequences of this stimulation are increased blood circulation and micro-circulation within the skin and under-skin tissue. This increased blood circulation within the muscle system results in a relaxation effect. Besides increasing oxygen flow and metabolism, direct skin stimulation also enervates the immune system associated with the skin. Chronic and acute inflammation of inner organs may affect changes in the skin and hypodermis (i.e., dryness or bloating) through the nerves, and can extend from these inner organs to skin areas supplied by the same blood vessels and nerve fibers. Conversely, through increased mechanical stimulation of reflex points or skin zones with the acupressure applicator, the metabolism as well as the oxygen supply to the inflamed organ increases. 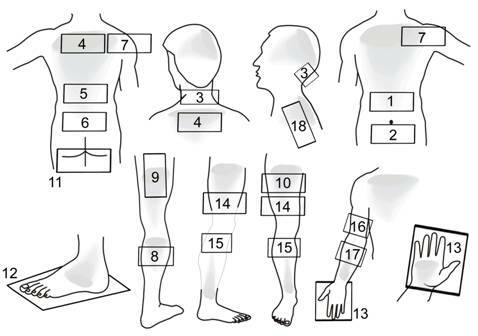 Traditional Chinese medicine utilizes this phenomenon through stimulation of acupressure points to balance and correct irregular energy flow. NOTE: Frequent, focused and regular mild skin stimulation trains the self-regulating ability of the body better than strong irregular stimulation, and has a positive effect on the involuntary (inactive) nerve system. The pain-relief effect of the Prickly Pad™ is based on two mechanisms: The application mechanically stimulates the receptors in the skin and hypodermis and charges the fast-conductive nerve fibers that control the "pain gate" in the spine. In parallel, the minimal pain caused at the beginning of treatment due to direct stimulation of acupressure points quickly increases production of endorphins (the body's own opiate), and this may relieve or end both primary and secondary pain.